So I thought the Batty Felt Pillow needed a little companion. At first I thought I would follow up on some one's suggestion to make a white on white ghost pillow, or an orange on orange pumpkin pillow. I fiddled around with the orange felt and decided that I didn't want to do just another same old felt pillow that mimics exactly the bat one. To make the pillow, get a pillow form- mine was 12"X16" (they are 50% off at Joann's right now). Cut two pieces of black felt, one 13"X17" (to account for seam allowances) and the other 13"X24"- then cut the longer piece in half. Take those two pieces and on one 13" side, fold over about 1" and sew down. This creates the pieces for the envelop back- and since felt stretches- it will help keep your pillow cover from getting too misshapen. To make your pumpkins, cut out a horizontal oval, with a stem on the top of one of the long sides. Cut a vertical oval about the same height (or slightly smaller) as the larger oval, but narrow. 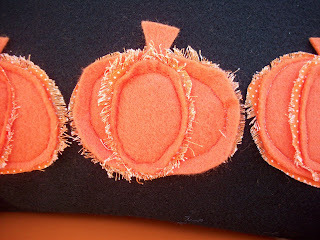 Use the pumpkin pieces as templates for the orange fabric and cut the shapes slightly larger than the felt. (I did not cut the stem into the fabric- it's just the oval). 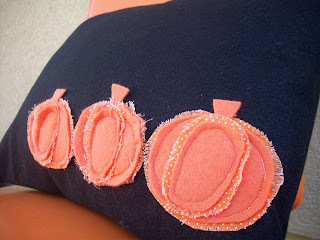 To create the pumpkins sew the large oval to the large piece of fabric- around the edge- about 1/4" away. Then place the small felt oval on the small fabric piece and sew the two pieces together in the center of the large oval. Again- depending on the look you like it's probably easier to do this before sewing them on the black felt. You can fray the edges and trim them up, without having to try to get all the little strings off the black felt. When you have them ready, place them on the front piece of the pillow and sew them where you like them. Keeping the right side of the front piece up, place the right side of the two back pieces DOWN on top- lining up the outer edges. (they should overlap each other by a few inches). Sew around all four sides of the pillow. Clip the corners, turn right side out- and stuff in the pillow form. And what a great friend it is! Thanks for linking up! If you didn't, make sure to leave a comment so you're eligible for the giveaway. you love me soooo much! OMG I love the ideas! they are awesome pillows (the bat and the pumpkins.) beautiful. I ♥ them. This turned out so WONDERFUL!! This is fo sho going on my to do list!! My mil and I are still flipping out over the bats so...she is going to die when I show her this! I am totally hitching my wagon to you girl!! I love BOTH of the pillows. What a great idea. I am now your newest follower. Those pillows are wonderful! They are so cute plus they would be soft too! 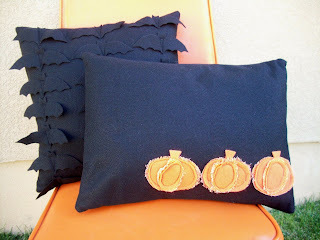 I love the bats and the pumpkins are so fun - I love that fabric that you added it makes them a little bit whimsical. Love them both! Super cute!! 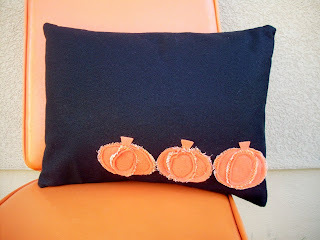 I love the orange polka dot frayed fabric on the pumpkins. It adds just a little more flavor to the pillow. Thanks so much for linking up your cute project. Cute little pumpkins. Makes a really cute pillow. Of course anything with bats is coooooool!!!!! Another cute pillow. I think I like this one even better than the bats. Love the frayed fabric peeking out! I just saw this on Tatertots and Jello, they are so darn cute! You did a great job on these. Super cute! I just came by from Tatertots and Jello.